According to Business Week, Newmont’s $4.8 billion construction on a gold deposit was put on hold yesterday due to the presence of 2,000 people–some riding in on horseback–to protest against the mine. Adjacent to Yanacocha Mine, Minas Conga sits on gold deposits that are estimated to produce between 580,000 and 680,000 ounces of gold per year and considered to be vital to Peru’s mining industry, as well as local economies. The people of Cajarmarca and the surrounding highlands should be thrilled. Right? 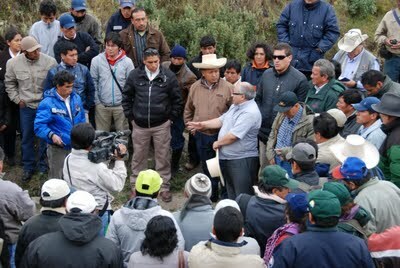 Perhaps a little background on Cajamarca is needed to understand why the locals may be a bit hesitant to have yet another mine take root in their communities. Yanacocha, located in the Norther Peruvian Andres, nestled high in the mountains, was opened by Newmont Mining company in 1993 and has since produced 26 million ounces of gold and is the most profitable mine in the Andes–hitting $22.3 billion in total assets in 2009. So, why aren’t the people of Cajamarca thrilled? 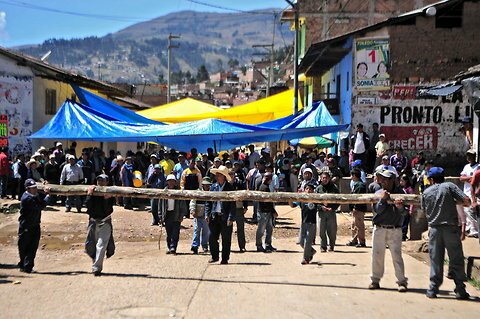 From cyanide and other heavy metals looming over their heads (literally), and contamination of air, water, and soil, the people of Cajamarca have another reason to despise Yanacocha’s current presence, in addition to Minas Conga impending one. A mine is unyielding and ever present. The sound of mine blasts reverberate down the canyons like an impending storm. Day and night, mining trucks troll through the streets carrying materials to and from the mines. This might not seem so bad to some (especially in comparison to the other problems a mine induces), but if you heard these Toyota six pack diesel trucks, you might think otherwise. Aside from the truck’s noise, many of them carry mercury left over from heap leaching. In June, 2000, a truck carrying mercury from Yanacocha had a container leak, spilling an estimated 300 pounds of mercury. In villages like Cajamarca, little is known about the adverse effects of mercury on human health, and many villagers not only collected the liquid mercury droplets, but burned them in their homes. Newmont Corporation offered reimbursements for the mercury’s return, which sent villagers to the streets to scour for any remaining mercury. More than 1,000 people were diagnosed with mercury poisoning. Now when asked, the people of Cajamarca say mercury kills their babies, causes cancer, as well as other fatal diseases–not entirely false accusations. Like things weren’t bad enough already, mercury bioaccumulates, or increases in concentration in organisms over time. Mercury builds up in food chains through smaller organisms being eaten by larger ones–consequently, the organism highest in the food chain has the highest concentration of mercury–these animals are usually consumed by humans, posing a serious threat to their health and well being. Health ailments from the mercury spill remain today among community members. Events that had never occurred in the town are becoming more prevalent: children being born without fingers or toes, miscarriages occurring at alarming rates. Children suffer disproportionately with chronic problems such as nosebleeds, respiratory infections, loss of hearing and or sight, migraines, and the inability to concentrate. As mercury is a common toxic byproduct of gold extraction, it’s not hard to see why people are protesting the construction of Minas Conga. Because the mines are located at the tops of watersheds, villagers and farmers are concerned that the mine will dry up water sources, and there is the risk that what water they do receive will be contaminated. Though Newmont claims its operations adhere to strict environmental regulations, Oxfam America reports, “The [mining] engineers tell us there is water, and no pollution, but we know the land does not produce as it used to, and there is less water than ever,” says a 24 year old from Bajo Porcon, a village halfway between Cajamarca and the mine. Though extractive industries entered Latin American countries like Peru under the guise of providing development, has any actually occurred? Yes, corporations like Newmont have provided roads, schools and medical facilities to Cajamarca, but would they be better off not having these luxuries but clean water to drink, clean air to breath, and clean soil to grow crops in? There is a darker side to our golden commodities, and it’s no wonder people from Cajamarca aren’t thrilled with the prospect of another mine. 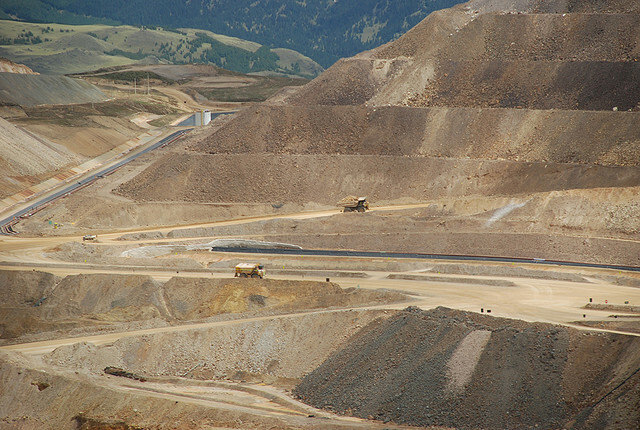 Though Newmont has halted construction for the time being, it’s only a matter of time until Minas Conga is up and running.